We’d love your help. Let us know what’s wrong with this preview of Fun, Frugal and Green Halloween by Kerrie McLoughlin. Wanna Rock Halloween With Your Kids? Find out how to do the pumpkin thing without a knife, new traditions to start (like how to “Boo” your neighbors and friends), how to handle Halloween haters, how to green your Halloween and top it all off with a Pumpkin Pancake recipe. 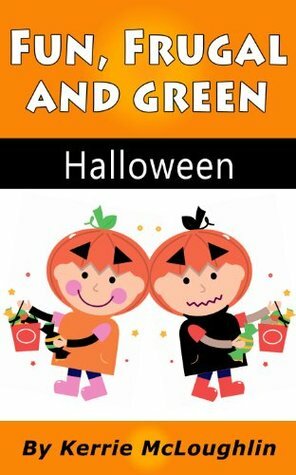 “Fun, Frugal and Green Halloween” is about the humorous journey of parenting through a candyrific holi Wanna Rock Halloween With Your Kids? To ask other readers questions about Fun, Frugal and Green Halloween, please sign up. If you've ever wanted to have a book where you will find all the information needed to make the best Halloween party ever, you no longer have to think about it because such book is written by Kerrie McLoughlin. ÂThe Kerrie Show Takes on HalloweenÂ Is exactly that kind of book, made of numerous handy tips starting from how to make the perfect pumpkin or other appropriate decorations up to the part how to handle various types of Halloween haters. You know these guys who are saying that dressing up If you've ever wanted to have a book where you will find all the information needed to make the best Halloween party ever, you no longer have to think about it because such book is written by Kerrie McLoughlin. ÂThe Kerrie Show Takes on HalloweenÂ Is exactly that kind of book, made of numerous handy tips starting from how to make the perfect pumpkin or other appropriate decorations up to the part how to handle various types of Halloween haters. You know these guys who are saying that dressing up as a ghost means suicidal tendencies or the ones who are saying that sugar and sweets are something to avoid. This book same as her Tater Tot cookbook is filled with her wiggly funny comments and due to the entertaining subject that is making this book even more funnier and recommended for all readers, regardless of age. Kerrie is a mom of 5 kids and the book is written from the mom perspective making it perfect for all moms who want to make their kids happy. No matter how experienced you are in celebrating of Halloween I suggest that this year on time you give yourself an opportunity to maybe learn some new trick that will make happy your children, family, friends or just yourself. Kerrie McLoughlin wants everyone to have as much fun with life as she does! She loves to make readers laugh while informing them at the same time on various topics such as cooking, writing for magazines, being a successful work-at-home mom, creating a rockin' direct sales blog, making celebrations and holidays fun with and for kids, homeschooling, being a laid-back parent and more! She has written Kerrie McLoughlin wants everyone to have as much fun with life as she does! She loves to make readers laugh while informing them at the same time on various topics such as cooking, writing for magazines, being a successful work-at-home mom, creating a rockin' direct sales blog, making celebrations and holidays fun with and for kids, homeschooling, being a laid-back parent and more! She has written articles for over 160 regional parenting magazines and enjoys proofreading/editing at Fiverr.com. Check out her other books on Amazon and her blogs at The Kerrie Show, Laid-Back Homeschool and Get Published in Parenting and Family Magazines.